When you are buying a home, whether in Parkland County, the Edmonton area, Stony Plain, Spruce Grove, or elsewhere in Canada, the type of mortgage you choose, the down payment, the amortization period and even the payments make a difference. To get you started, here is a review of the most common types of mortgages. By assuming the existing mortgage, you may be able to save on the usual mortgage fees such as appraisal and CMHC fees. You will save time, since you do not have to negotiate to arrange financing from another lender and the existing mortgage on the home may be less than the current market rates. Alberta is the only province in Canada which allows for an assumable mortgage. You simply apply cash that has already been paid toward the mortgage and resume payments. Some institutions may require you to qualify. With a VTB, the vendor also becomes a lender, holding all or some of the mortgage. Sometimes the vendor will offer this loan at lower than bank rates. Low down payment mortgages - with down payments as low as 5% - must be insured to cover potential default of payment and their carrying costs. Therefore, this mortgage is higher than a conventional mortgage as they include the insurance premium. Low down payment mortgages are often referred to as National Housing Act (NHA) or High Ratio mortgages. Both Canada Mortgage and Housing Corporation [CMHC] or GE Capital Mortgage Insurance Company (Canada) [GE] offer default insurance. You are responsible for appraisal and legal fees and the application fee for the insurance. With a closed mortgage, the interest rate is locked in for the full term of the mortgage. You must pay a fee to renegotiate the interest rate or pay off the balance before the end of the term. Closed mortgages are the most effective when interest rates may be rising and for people who are not moving in the short term. First-time home buyers find them especially appealing, as mortgage payments are established for a set time frame. The interest rate for closed mortgages may be lower than for open mortgages. These mortgages are available in terms from six months to 25 years. Flexibility is a prime advantage of an open mortgage. They can be repaid either in part or in full at any time, without incurring any additional costs. This mortgage, however, is generally available for a term of six months or one year. Interest rates for open mortgages may be higher than for closed mortgages because of the added flexibility. In these two situations, you could save a tremendous amount on interest costs: 1) when you're planning to sell your home soon without buying another and you speculate that interest rates are falling 2) when you think you may be able to pay down a considerable portion of your mortgage debt in the near future. A convertible mortgage is a fixed-rate mortgage that provides the same security as a closed mortgage. It can also be converted to a longer, closed mortgage at any time without cost. With a fixed-rate mortgage, the interest rate is locked in for the full term of the mortgage. Buyers know the payment amount throughout the entire term. Fixed-rate mortgages could be either open (could be paid off at any time without costs) or closed (costs apply if paid off prior to maturity). With a variable-rate mortgage (sometimes referred to as a floating mortgage), mortgage payments are set for a term of one to two years or longer although interest rates may vary during this time. If interest rates go down, more of the payment is applied to reduce the principal. If rates go up, more of the payment is applied to interest payment. Variable-rate mortgages may be open or closed. 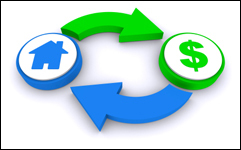 With a variable rate mortgage a buyer has the flexibility to maximize upon falling interest rates and to convert to a fixed-rate mortgage at any time. If you suspect interest rates will rise, you may want to lock in your fixed rate for a long time. If you speculate that interest rates are headed downward, a shorter time may be a good choice. Prior to signing any mortgage document, you will want to ensure you understand the conditions, terms, payment schedules and consequences of non-payment. Also be sure that your lawyer, accountant and even your REALTOR® has reviewed the documents so you are protected against any surprises.